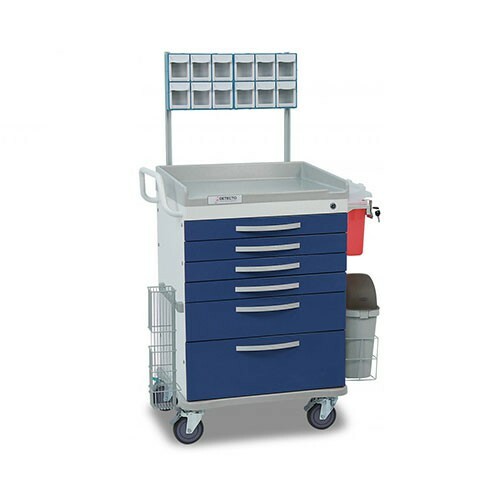 WHISPER Medical Anesthesiology Carts, by Detecto, are top-of-the-line, medical-grade storage carts that are designed with a medical-grade powder-coat blue paint exterior to distinguish its designation for the anesthesiology departments of facilities, designed with 360-degree rotation for tight corners. The Anesthesiology model is available in both 5-drawer and 6-drawer options, with both available as basic or deluxe models. The WHISPER series offers features that are unparalleled in the clinical mobile storage market, such as drawer facades that quickly snap off and back on and completely-sealed drawer rails with no exposed seams for quick and easy hygienic wipe-down cleaning. Furthermore, the deluxe models come equipped with accessories requisite for the anesthesiology department, including a sharps container holder, 12-bin organizer with accessory bridge, catheter holder, waste bin, and two accessory rails. WHISPER Medical Carts, just like their name implies, offer the quietest in rolling convenience with their insulated interior walls and the soft-close drawers glide shut for superior convenience. The carts are built for balance and stability with a superior design that keeps the carts from toppling over, even when the drawers are fully extended. The WHISPER is manufactured from DETECTO's quality aluminum body construction with powder-coat paint for confidence and consistency. Vitality Medical also carries Detecto's RESCUE Medical Cart, as well as other storage items, such as the Bergan Smart Storage. Two Parking Locks and One Steering Lock on Wheels. Included Accessories with Deluxe Editions: Sharps Container Holder, 12-Bin Organizer with Accessory Bridge, Catheter Holder, Waste Bin, and Two Accessory Rails.